Manu Srivastava is a well-recognized vocalist, who is dedicated to carrying on the legacy of Indian Classical music to the next generation. His vigorous training under the late Pt. Kashinath Shankar Bodas of the Gwalior Gharana, has inspired him to carry on Kashinathji’s legacy. 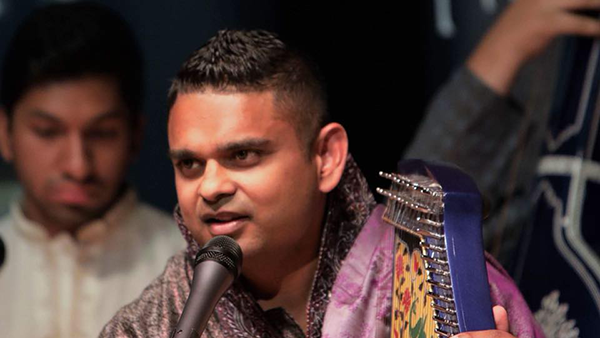 His evolution as a vocalist, through intense daily riyaz and training, has earned him known for his performances at many prestigious festivals in India. Dedicated to imparting his knowledge of shastriya sangeet to the next generation, he founded the Phoenix Gharana School of Indian Arts in Phoenix and has trained over 200 students in this classical art. Manu Srivastava was accompanied by Sanatan Goswami on the harmonium and Prafulla Athalye, a disciple of the Late Ustad Allarakha on the tabla.